Event starts at 7:30 and is always free to the public. This will be the last Playmakers Night in the room where it began - join us for the final new work celebration in the converted loading dock that launched a hundred plays! 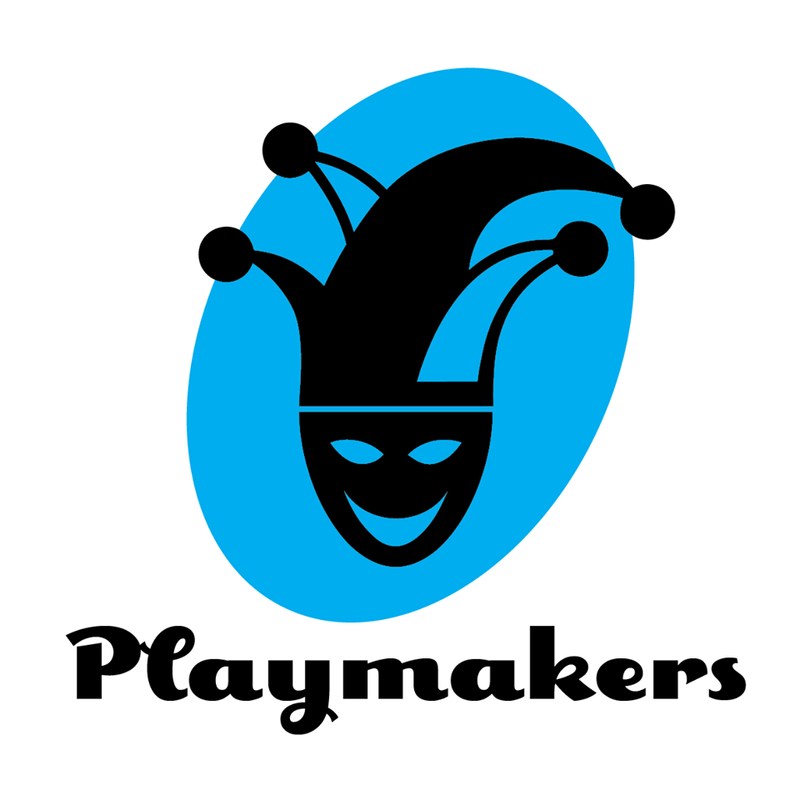 Playmakers is supported in part by a grant from the BCA Community Fund. Antonello Borra lives in Burlington and teaches Italian at the University of Vermont. His other volumes of poetry are Frammenti di tormenti prima parte) (Longo: 2000), (Frammenti di tormenti (seconda parte) (Lietocolle: 2006), and the two illustrated bilingual Italian-English Alphabetabestiario. Off Center for the Dramatic Arts is excited to launch the 3rd Annual Spring Open Artist Showcase. For nine years, Off Center for the Dramatic Arts (Off Center, OC) has worked to provide a home for independent theatre and performance in Burlington. We want to celebrate our community with a special two-week festival doing what we love best: presenting vibrant local theatre and performing artists. What is the SPRING OPEN ARTIST SHOWCASE? The Spring Open Artist Showcase is a two-week festival running April 25-May 4, 2019. Four Vermont artists or companies selected by lottery will each present a 60-minute show on a double bill for one weekend at Off Center for the Dramatic Arts, with performance rental, technical support, and group festival promotion organized by Off Center volunteers. Each company will receive a third of the box office proceeds from the weekend of their performances. All theatre and performing artists/companies in Vermont are eligible and encouraged to apply. The four productions will be selected at a public lottery held Friday, February 22th. There is no application fee, but each artist or company can submit only one application per category (solo or group). How does the Showcase Lottery Work? The second drawing will pull from group applications who have produced work at OC before, as a way to give back to the community of artists that OC has built. The third drawing will pull from group applications that have never produced work at OC before, as a way of expanding our reach to new artist groups. The final drawing is a “Second chance” drawing, when ALL the applications that were NOT selected are thrown back into the jaw for one last pull. It complements the ethos of OC: chaos, community, and a little extra luck. All completed applications received by 5:00 PM on Friday, February 15 will be placed in a lottery, with a public drawing held Friday, February 22. We will also draw a waiting list. What Do the Showcase Artists Get? What Are the Showcase Artists’ Responsibilities? CLICK TO ACCESS THE ONLINE APPLICATION FORM HERE. No applications accepted after 5 PM on Friday, February 15, 2019. Actors and performance folk who are interested in participating are all welcome to come and participate . Experience in devised work not important, just a sense of adventure and an open mind. Come play, let's build something new! In Constellations, the principles of string theory give a love story an epic twist in a play about time, probability, and the power of human connection. Following successful performances in Warren, Montpelier, Woodstock, and Waterbury, Green Room Productions' Constellations will be performing at Off Center for the Dramatic Arts March 14-17. Physicist Marianne meets beekeeper Roland at a party. They go for a drink ... or perhaps they don't. Marianne's engaged ... or perhaps Roland is married. Or maybe they're both single. Nick Payne's smash Broadway hit play (in which Jake Gyllenhaal played Roland) takes this chance encounter between two lost souls and opens the door to the infinite possibilities of their relationship. Breathlessly navigating through the spellbinding and romantic journey of being in love, Constellations looks at how the tiniest change in the detail of our lives can lead us on completely different paths. Check out the reviews from Times Argus, Seven Days, and The Herald (Randolph, VT)! Tickets for Thursday are Pay What You Can, and Friday - Sunday are $15 and are available in advance here. NEW DATE! DUE TO THE JANUARY SNOW STORM, THIS EVENT WAS RESCHEDULED FOR SUNDAY MARCH 10.
and the Theater Community Who Loves Them! 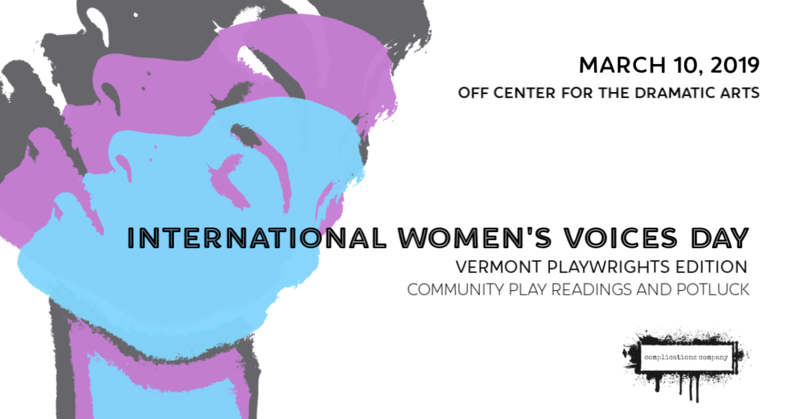 Complications Company is producing the second Vermont Playwrights Edition of the International Women's Voices Day, in solidarity with women playwrights around the globe and in celebration of the voices here at home. This community showcase reading and potluck dinner highlights the strong women’s voices on the stages of Vermont. The readings and potluck will take place on Sunday, March 10, 2019 – International Women's Day weekend, and right in the middle of Women's History Month. We will be meeting at the Off Center for the Dramatic Arts in Burlington. Parking and seating can be limited, so please plan to come early! Also, remember it is the Daylight Saving Switch Day! Join the Off Center gang for a great social celebrating the official Spring Open 2019 Artist Lottery! We shall all gather to draw the names at random of the four artists and companies who shall present their work at the Spring Open Artist Showcase, have a few drinks and tacos, and celebrate the determined spirit of independent theater and performance in Burlington. The Artist Lottery and Taco Social begins at 7:00 pm, and will be held at Taco Gordo - 208 N. Winooski Avenue. ​Open to everyone! Raise a glass and support our local creative performing artists! Burlington, VT - Stealing from Work is back with a full show of brand new sketch comedy written by Angie Albeck and Marianne DiMascio. New sketches! New songs! New fart jokes! Cast: Chris Caswell, Marianne DiMascio, Amy Halpin Riley, Alex Hudson, Jory Raphael, and Geeda Searfoorce. Stealing from Work is immature humor for mature audiences only. *Tickets for Thursday, February 7th, are “pay what you can” and are only available at the door. Tickets for performances on February 8 - 10 may be purchased by calling 86-FLYNN, or online HERE. 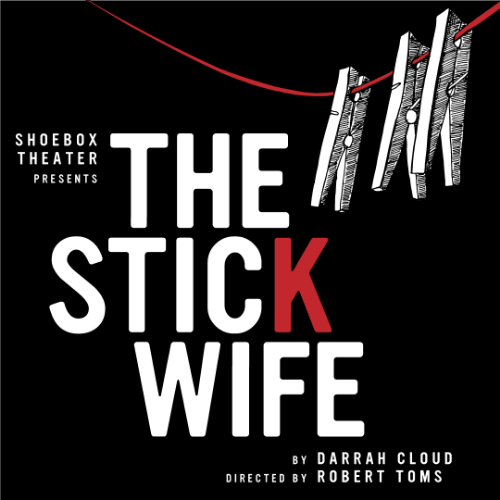 The Shoebox Theater is proud to present The Stick Wife by Darrah Cloud. Cast: Tracey Girdich, Syndi Zook, Monica Callan, Aaron Masi, Todd Townsend and Gene Heinrich. Doors open at 7 p.m. each night, show at 8 p.m. Arrive early and have a cocktail in the pre-show lounge! In ''The Stick Wife,'' Darrah Cloud examines the people and events surrounding the 16th Street Baptist Church bombing of 1963 in Birmingham, Alabama where four African-American girls were killed and 22 others were injured. The play focuses on the perpetrators and their wives, racism, and members of the Ku Klux Klan. It is an amazing story that stands the test of time. The play possesses incredible emotion, joy and a cathartic nature that cannot be explained. It is a true metaphysical journey colliding with brutal reality — misogyny, racism and escapism, all rolled up into one. ​January 18 - 19 at 7:30 p.m.
Matinee on January 19 at 2:00 p.m.
​Bald Mountain Theater is proud to announce the return of its annual event for all ages, “There Once Was …,” on January 18-19 at Off Center for the Dramatic Arts in Burlington, VT. This year, the featured tales are drawn from the rich storytelling tradition of Ireland. Professional actors, directors, and musicians, including some of Burlington’s finest, will showcase the results of a week-long creative intensive. Cael Barkman, Chris Caswell, Andriana Chobot, Jordan Gullikson, and Sasha Olinick have come together in collaboration with Artistic Director Ethan Bowen to stage vibrant stories in innovative ways. 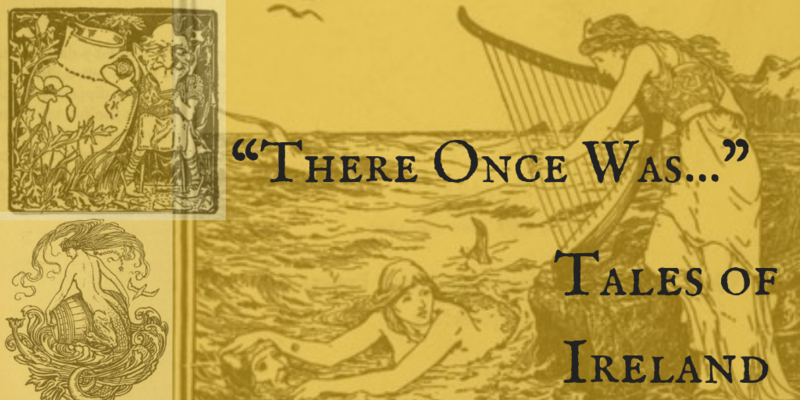 Featuring fickle fairies, rowdy ghosts, forlorn selkies, and sorceress stepmothers, these tales paint a mirthful, moving portrait of a country steeped in magic. Wild, wonderful, and playful, “There Once Was …” is a treat for the whole family. Come enjoy the fun!